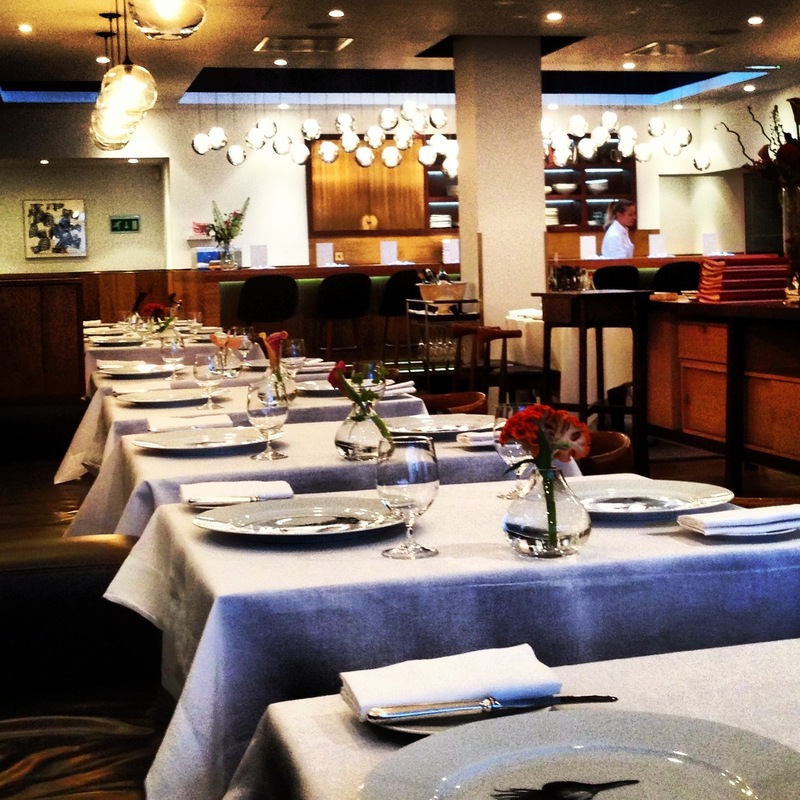 Home » ★★★★☆ » Pollen Street Social. Getting your just desserts. Pollen Street Social. Getting your just desserts. Why haven’t I been here before, says C. It’s the sort of place we like isn’t it? Yes, indeed, it is the sort of place we like. But it’s the sort of place we can rarely get into without planning months in advance, so that when I saw that there was a table free at lunchtime on Monday, I jumped at it. It was the end of the summer holidays, it was a Monday, it was inexplicably quiet. Oh and it was our wedding anniversary. Although I got the day wrong. The vibe is modern and expensive. It is just had a refurb, according to the maitre d’, but I wasn’t able to tell what had changed. My memory doesn’t go back two years. These days it doesn’t go back 2 minutes, frankly and we were lucky that I remembered it at all. Like the anniversary. I was still arguing about the date when delivered in a wooden box that looked like a book were three very lovely amuse-bouche. 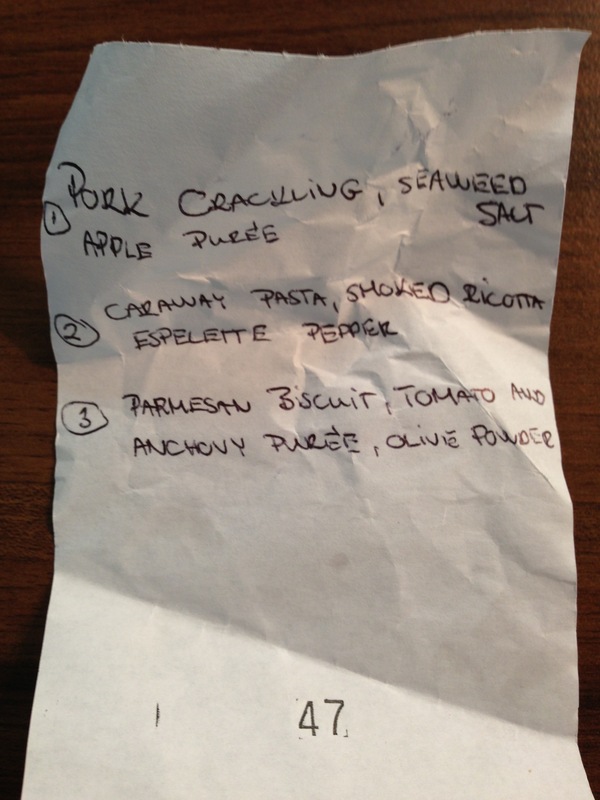 There were so many ingredients that I asked the lovely maitre d’ to write them all down. Because we only have a short time together, I won’t go into the detail, but let’s just summarise it by saying crispy pork crackling, Parmesan biscuits and caraway crackers. All of them delicious. Lots of interesting textures and flavours and care taken with the presentation. I did make the poor man write are out all the ingredients for me though. I think I am getting worse. 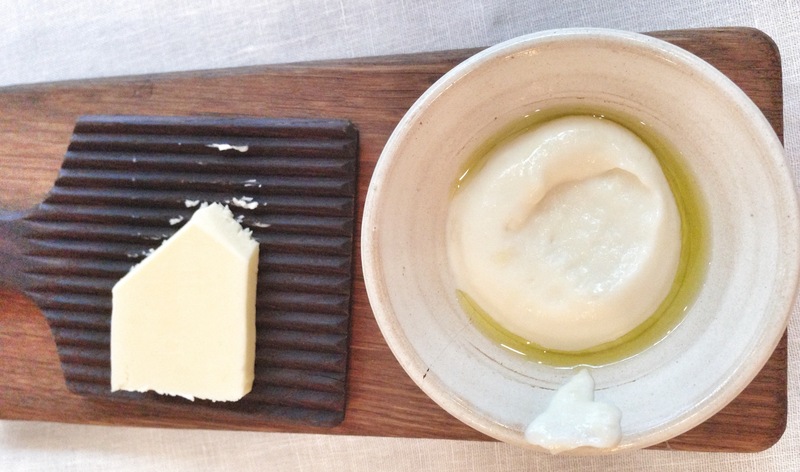 Obviously there was bread; an excellent sourdough and a plain white, served with the most sublime smooth, creamy subtle salt cod brandade, as well as good unsalted butter. Because I had tried on some clothes before I came out, I limited myself to just the one piece. I ordered against type. Actually I first ordered the roasted Scrabster lobster, with Girolles, Iberico ham and young leek which is entirely normal but obviously it was the only dish they didn’t have on the menu that day. As I had already mentally prepared myself for seafood, I went for the line-caught Devon squid, cooked in cauliflower, roasted squid juices, ink rice and sea herbs. I was expecting something black, like a squid ink risotto, but no. This looked like a pale risotto in an inky broth. The texture was similar to risotto and the squid was finely chopped and creamy. I adored this dish, it was subtle and restrained and the squid was perfectly cooked and soft. I actually forgot about the lack of lobster. It didn’t manage to make me forget about the rather inappropriate Hendrix-style soundtrack, shredding my nerves. I asked them to turn it down. Just wrong. Fine (almost) if you have a full buzzy restaurant. Intrusive with only two tables filled and echoing off the walls. And I no longer care whether they think I’m an old bag. I am. 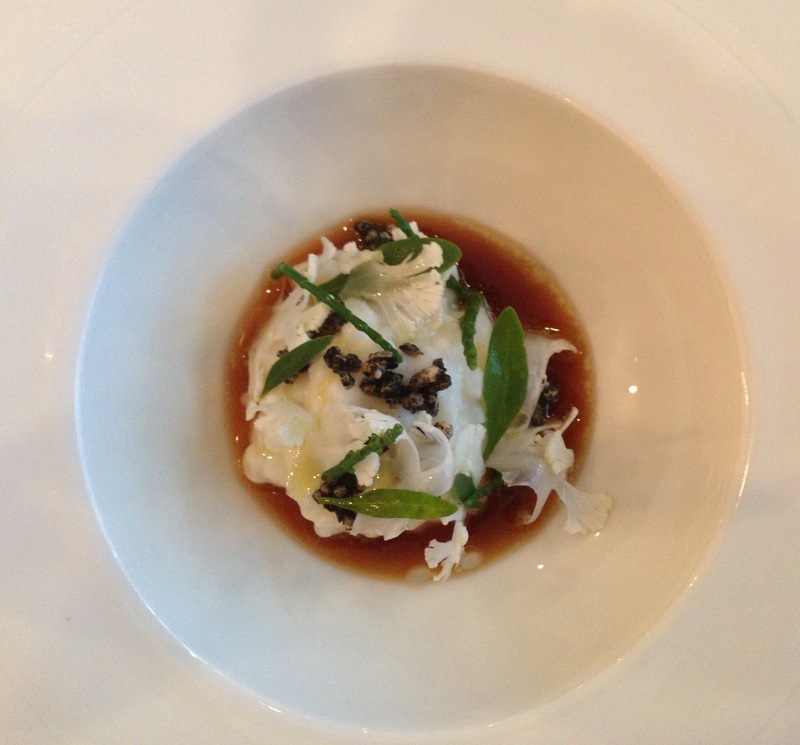 C chose the Colchester crab salad, coriander, pineapple, shiso leaf, compressed fennel and Espellette pepper. Had he taken a better photograph, I could have shown it to you but he hasn’t quite mastered the art of the iPhone. It was pronounced delicious, complex and subtle. 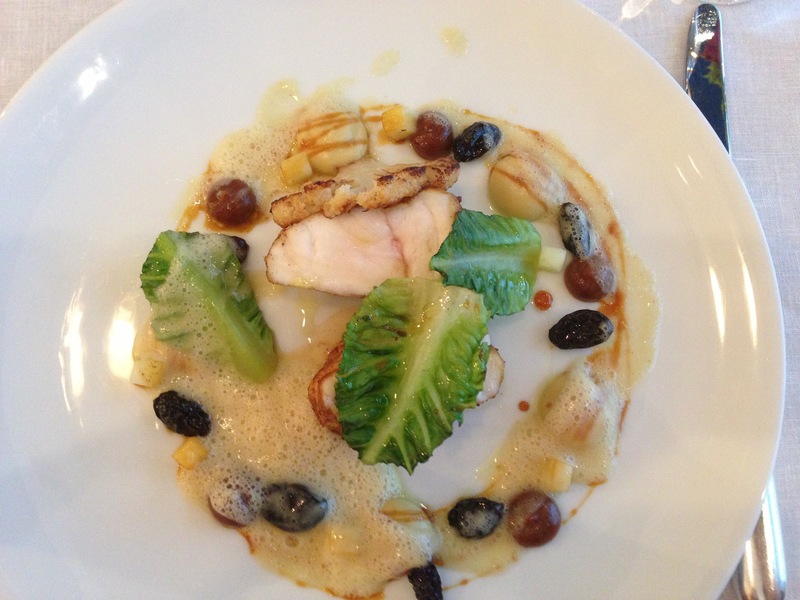 And then, because it was hot, I went for the Roasted Dorset monkfish, cauliflower, dehydrated grapes, apple & curry, spiced caramel. Very pretty plateful, this was, with lots of interest and flavour. 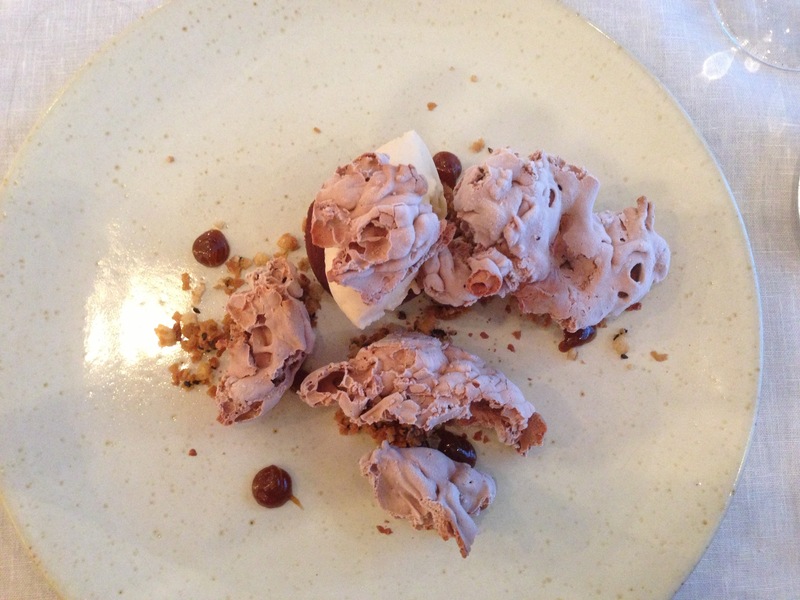 I have to say that this was the least gorgeous of the things that I ate at the restaurant. What I particularly didn’t love was the way that the monkfish leaked liquid onto the plate which interfered with the sauces around the dish and watered them down. Otherwise it was a good, interesting dish. My somewhat lukewarm reaction to my dish was in stark contrast to C’s enthusiasm about his Buccleugh Estate fillet of beef, braised short rib, brown onion purée, crispy potato salad and bone marrow crumb. He liked the meat so much that he thought everything else was unnecessary. It also came with a side order of olive oil mashed potato. I had a taste of the meat. It was as good a piece of beef as I have tasted. I am not with him on the side bits. I loved the crispy potato salad and the onion purée and I managed to force myself to have rather a large amount of the mashed potato which was superb. I had ordered the wrong dish. Not for the first time. And then because obviously we really needed, dessert. 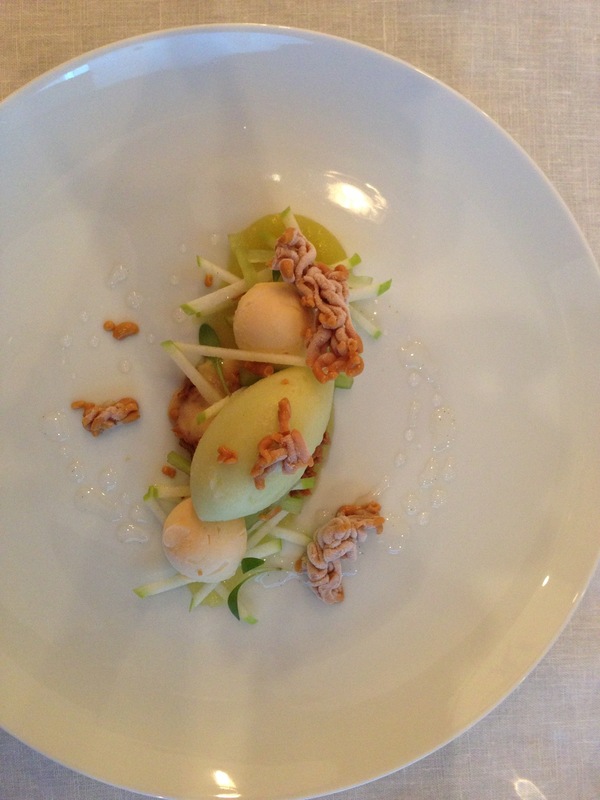 Thai flavours : cryogenically frozen peanut squiggles, apple and celery batons, peanut parfait, yuzu cherry sorbet – a lovely refreshing dessert if you like peanut butter, as obviously I do. Skippy’s honey roast nut-crunchy, rare as hens’ teeth, since you’re asking. But again, for some reason I ordered against type because opposite, taunting me with its gorgeousness, was a chocolate dessert of wondrousness. Chocolate coral, which was curly frozen chocolate sheets, with banana ice cream atop a chocolate and caramel ganache. God it was fantastic and God was indeed looking down on me because C couldn’t finish it, so I did. After all, my dessert had celery in it, so it didn’t count. And I nearly forgot to mention the frozen raspberries in white chocolate and ginger and the green tea macaroons. Very nice too, as they should have been, accompanying a coffee priced at £5.50. This is a very self assured and comfortable restaurant . The cooking is elegant and subtle, yet quirky and original, with care taken over the ingredients. The menu tells you how many miles the food has travelled. There is a set lunch and there is a dessert bar of joy. What’s not to love? Look, bless he wrote it down for me. 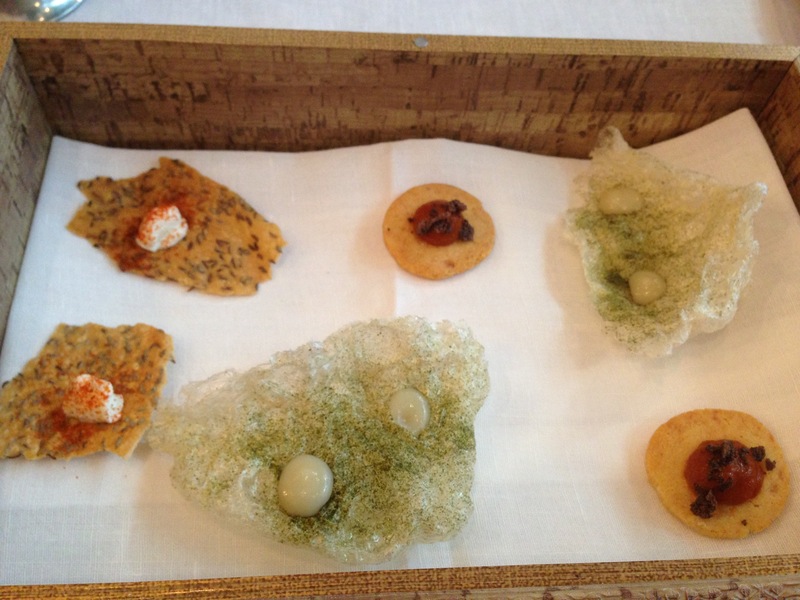 The amuse. Squid but not squid-y. More risotto-y. Thai flavours. Squiggly peanut buttery thing. Yeah Social Eating House is rather good too. His new Berners Tavern at the London Edition Hotel looks rather beautiful – shall look forward to giving it a try. Is Jason Atherton taking over the world? I think so. Going to Social next month. I know EveryMealMatters wasn’t keen on Lil Soc but I thought it was rather charming! I know. Thanks for that. I’m going to try it anyway though- it’s handy for work and looks client-friendly. I’m looking forward to Hutong too!